KUALA LUMPUR, March 18 — The highest number of retrenchments within a five-year span was recorded last year, according to the Human Resources Ministry, with 38,499 layoffs across all sectors. In a written reply to Tan Kok Wai (DAP-Cheras), the ministry said the manufacturing sector had the highest number of retrenchments over the last three years. The highest number of retrenchments was recorded in 2007 (42,336), 2008 (47,145) and 2009 (64,516). It said retrenchments could be categorised into ordinary layoffs and through the voluntary separation scheme (VSS). Workers who are laid off will be paid according to the Employment Act 1955 or their collective agreement, the statement said. Tan had asked the ministry to provide a breakdown of the number of workers retrenched by the various sectors in the last three years, following the economic downturn and oversupply of workers and its strategies to amend the nation’s human resources policy. In January this year, 5,009 workers were retrenched compared to November (9,986) and December (5,758) last year. The reduction in the number of layoffs shows the economy is getting stronger compared to the previous year although the current impact of the economic downturn is in its early stages, it added. Voice for better treatment of bankrupts in Malaysia! I AM writing in support of writer of 'Temper punishment with justice to bankrupts' as published in The Star on March 4. In the United Kingdom, the bankruptcy laws have been revised to discharge bankrupts from a period of three years to one year. It gives them a second chance speedily as it is believed that punishing bankrupts makes people fear taking risks. Reducing the cost of failure should stoke entrepreneurship. It distinguishes between 'no fault' bankrupts (corporate guarantors etc) and those who have got into trouble simply by living beyond their means. It is a policy of forgive and forget. In Australia, bankrupts have a choice of paying one third of their debt for immediate discharge or wait for two years for automatic discharge. In the United States, bankruptcy is a battle-honour among businessmen and fairly painless for those who can't pay medical or even credit card bills. In Malaysia, there are more than 160,000 bankrupts and the number is increasing as there is no automatic discharge, which increases the workload of the Official Assignee, Immigration and banks. Life is tough for bankrupts with so many restrictions imposed and sometimes they are treated like pariahs or common criminals. An example is the restriction on overseas travel. Similar restriction is also imposed by the EPF, Income Tax Dept and PTPTN. Whilst the spirit of the law is to ensure people do not flee the country without settling their debts, it has been turned into a punishment. Such criminalisation of financial debt is totally unjust. I would therefore urge the Government to urgently review the Bankruptcy Act 1967 as well as EPF Act 1991 and other laws which are antiquated. My support for @Rev Dr Khoo. Let's petition to the authorities to make a change especially in this difficult time of Global Economic Crisis. Some bankrupts are genuine or victims of circumstances. They should be given justice or more understanding to come up in life again in whatever way they may be able to contribute to the society instead of imposing too many restrictions, some of which may be outdated/not applicable to this time of change and globalisation. I AM writing in to express my opinion on the conditions imposed on bankrupts by the authorities. I understand the reason for having a bankrupt's international passports withheld besides having him blacklisted by all financial institutions, making it impossible for him to secure a loan for any purpose. However, I feel that the authorities concerned must also look into these measures on a case by case basis. After a period of 10 years, the international passport of a bankrupt who has abided by the conditions imposed on him should be returned to him to enable him to travel with his family when necessary while the bankrupt should remain blacklisted until he or she settle the loan. I feel this is not asking too much as even criminals are at times pardoned after a few years for good behaviour. So why are bankrupts punished so severely? I once again call on all the authorities to treat bankruptcy cases on a case by case basis. Please help us regain some respect by being fair in handling genuine cases. Bankrupt at 72 Years Old, Millionaire Again at 82! In this Post, I would like highlight an EXTREMELY inspiring article I read on the Sunday Times (31st October 2006) entitled "82-year-old Comeback Kid Bounces back from Bankruptcy". 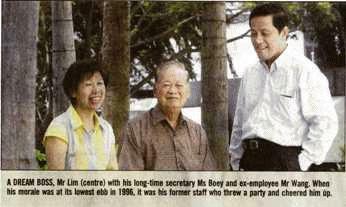 At the age of 72 years old, Lim Tow Yong was declared a BANKRUPT. The company he founded in the 1960s, Emporium Group Holdings which he built up to a sales revenue of $300 million has been crippled by the recession of the mid-80s and severe competition. His company chalked up debts of over $100 million. Most people at the age of 72 would either be dead or half-dead. Instead of feeling sorry for himself, he picked himself up decided to START ALL OVER AGAIN at the age of 72. He began going back into the retail business by setting up joint ventures with partners in Sabah, Labuan and Brunei. Ten years later, at the age of 82, he sold his 17 stores and supermarkets for $4.2 million making him a millionaire all over again! Can you imagine this? I truly salute this man. So for all those of you who are whining and complaining that you are too old, too tired and no money to make your millions, then stick this article on your wall and stare at it every single day. Think about it. This man not only started with ZERO, he started with -$XXXX. And at the age of 72, don't you ever dare tell me that you don't have more energy than him. These are the stories I read that continue to remind me of the POWER OF THE HUMAN SPIRIT and that everything is possible when you believe in yourself. Never ever give up. Fight till the very end. I remember watching Rocky (the movie about boxing) where Rocky Balboa (Sylvester Stallone) was being bashed up his stronger opponent. It looked so helpless and it seemed impossible for him to fight back and win. So, until you HEAR THE BELL that your life is over and that you are DEAD, you KEEP FIGHTING! Fear Cannot Not Stop Us From Dying, But it Stop Us From Really Living. Hopefully, you'll never have to face the decision of whether or not to declare bankruptcy. But for those of you who are in a situation in which it's time to at least consider it, I can tell you from personal experience, it isn't actually the end of the world, or the end of your financial future. Here's what happened to me. I was going to write a best seller. And it took time, commitment and money. My own spiral of debt wasn't from overspending, but from under-earning. I was compiling a book of original writings by best selling authors, and I had an interested publisher. I was living in a place where jobs were scarce, and I was also in a graduate program. I also had an overconfidence in the success of the project, that touched on arrogance. I was certain it was just a matter of time before the book was finalized, a very nice advance was in my hands, and a promising future of related sequels would be rapidly approaching. Unfortunately, the authors were much slower getting their chapters to me than I had anticipated, and suddenly there was a flux of several new books with a similar concept. The major publisher backed away, and without that I couldn't hold together the project. It died. I was left with $33,000 in credit card debt and with over $1000 a month in credit card payments- nearly all of which went to the interest. There was no way out that I could see, and after having creditors laugh at me when I tried to make arrangements I could handle, which were quite a bit below their lower limits, and after several months of feeling a great deal of anxiety and pressure, I had to investigate bankruptcy. As you may be aware, there are two main types of personal bankruptcy, Chapter 13 and Chapter 7. With Chapter 13 you get to keep your possessions (such as your house, your car, and other valuable property) and you make arrangements through the legal system to pay back a certain percentage of your debt to all your creditors over a few years (so that you might end up paying every creditor 20-50%, or more or less, of what you originally owed them). This is usually preferable to those with valuable assets they want to protect. Chapter 7 lets you write off all your debt (with certain exceptions such as child support and student loans) but doesn't allow you to keep valuable property- all of which is usually sold and income is used to pay creditors (You may be able to keep your car and some other assets in some circumstances, so it's worth checking out both options carefully to see which one is right for you). In my case, I was leasing a car and had no other assets. So, I hired a bankruptcy attorney (The fee was $500) and went through the process. All my credit card accounts were closed, and all my debts were dismissed. I felt so incredibly relieved and free, to not have that ever increasing burden on my shoulders. To my surprise, the leasing company allowed me to keep leasing the car, and it even became voluntary, as the lease was no longer legally valid after the bankruptcy, but they would lose money to get the car back now, depreciated but with the lease not completed. But there was one very real negative result of course: My credit rating became the lowest rating on the chart. And there was no way to avoid it staying that way for, at least officially, for the next 7 years. What I COULD control, was working during that 7 years to build up new credit history, and get new credit accounts, so that creditors during that time could see a responsible pattern, and consider granting more favorable terms, and so that once the bankruptcy fell off, my rating would be excellent again. The simple steps I followed immediately after the bankruptcy was complete were to find reputable credit card companies that offer secured credit cards- These are credit cards that require you to pay a deposit which goes into a locked interest-bearing savings account. One of mine was $100 for a $300 limit, and the other was $200 for a $500 limit. After a year I began to be offered more cards, and even some high interest, yearly fee cards which required no security deposit. Of course the rates and fees are much higher for those with bad credit, but it's imperative to begin to have credit relationships as soon as possible, and to be very responsible with them. After a couple of years, even though your bankruptcy is still on your credit score, creditors can also see you've been paying on time and handling your debt responsibly, and they can at their discretion offer you more credit, or credit with better terms, than you might expect to qualify for. You can also attempt to get credit from your bank or other financial institutions you might be connected with, (By the way, I recently got two nice checks in the mail- Apparently I had fulfilled the terms of the secured credit cards, since I automatically got checks for my original deposits plus interest. That to me was the final step in total recovery. When facing bankruptcy, 7 years can sound like an eternity. But I am now on the other side, and during that time I was able to build up positive and responsible credit relationships with several creditors. I was also able to negotiate better terms, sometimes by simply requesting lower rates, and sometimes by stating I was closing the account because I had better rates with other cards. And now, my rating is above 700, and shows no negative items. 1. Keep in mind that it really isn't the end of the world. Hey, Donald Trump has done it more than once. 2. Before making any final decisions, carefully research what is the best option for you, try negotiating with your creditors directly (never ignore them) and consider meeting with an experienced and reputable bankruptcy attorney. They understand the system and it's a relief to talk to one. 3. If you do declare bankruptcy, once it is completed and finalized and you can begin to have debtors again, immediately get a couple of credit cards, even though you will likely have to pay a security deposit. Don't accrue debt on them, but use them and pay the full balance monthly to begin to show responsible credit habits. I can tell you, from being on the other side, bankruptcy wasn't the end of the world. And I learned a lot through the process. If you ever have to face bankruptcy, take smart, responsible steps, and you will make it back to the land of financial opportunity. Timbalan Menteri di Jabatan Perdana Menteri, Datuk Liew Vui Keong, hari ini mendedahkan ramai penjawat awam di negara ini dibelenggu masalah hutang yang serius yang mungkin membawa kepada kebankrapan. Beliau berkata, pada 2009 sahaja Jabatan Insolvensi Malaysia melaporkan 1,086 penjawat awam diisytiharkan bankrap di mana 72.74 peratus daripadanya adalah lelaki. "Masalah ini perlu difahami oleh semua penjawat awam kerana belenggu masalah hutang boleh menjejaskan prestasi penjawat awam dan sekiranya prestasi terjejas dengan teruk maka boleh diambil tindakan tatatertib," katanya. Beliau menegaskan demikian ketika merasmikan Taklimat Akta Perlindungan Pemberi Maklumat 2010, Taklimat Kebankrapan dan Taklimat Bantuan Guaman kepada ahli Kongres Kesatuan Pekerja-Pekerja Dalam Perkhidmatan Awam (CUEPACS) di Jabatan Perdana Menteri di Putrajaya, hari ini. Turut hadir pada majlis anjuran Bahagian Hal Ehwal Undang-Undang Jabatan Perdana Menteri dengan kerjasama Jabatan Bantuan Guaman dan Jabatan Insolvensi Malaysia itu adalah Presiden CUEPACS, Datuk Omar Osman. Justeru, Liew berkata taklimat tersebut diadakan bagi memberi pendedahan kepada penjawat awam bagaimana untuk menangani isu berkaitan dengan hutang dan kebankrapan. Beliau berkata, ia juga bagi memberi penerangan mengenai Akta Perlindungan Pemberi Maklumat yang telah diluluskan oleh Parlimen tahun lepas dan telah mula dikuatkuasakan pada 15 Disember tahun yang sama, serta taklimat mengenai Bantuan Guaman untuk penjawat awam. "Ahli-ahli CUEPACS yang berpendapatan kurang dari RM25,000 setahun boleh mendapat perkhidmatan guaman percuma daripada Jabatan Bantuan Guaman dalam kes-kes seperti petisyen perceraian, tuntutan nafkah, tuntutan harta sepencarian, hak penjagaan anak dan lain-lain masalah kekeluargaan. "Sekiranya pendapatan lebih RM25,000 tetapi tidak lebih RM30,000 mereka hanya akan dikenakan bayaran minimum," katanya. The number of bankrupt Malaysians has increased threefold over the last decade, with more than 200,000 people declared bust last year. Revealing the worrying figures in parliament yesterday, Selayang member of parliament William Leong said a large number of them were those classified as youths. Leong said from 70,009 bankrupt people 1999, the figure jumped to 218,561 in 2010, the first five months of which saw some 38,357 people in the 25-44 age bracket being declared bankrupt. “This trend is very worrying because the status will affect the future of these youths,” he added. He said out of the more than 80,000 people declared bankrupt in the first five months of 2010, 24.12 percent were due to defaulting car loans, followed by personal loan (11.78 percent), housing loan (7.49 percent) and card credit (5.5 percent), among other factors. Leong said according to the Insolvency Department, majority of the car loan defaulters were aged between 35 and 44. He also said an average of 500 people had been declared bankrupt monthly in that year (2010), compared to the average of 265 in 2007, 227 (2008) and 330 (2009). “This is a sign that rising prices brought hardship to the people,” said Leong, reminding that food prices had increased by 15 percent between October 2010 and January 2011 based on World Bank Food Prices Index. “The prices of rice, sugar, cooking oil and flour have increased. World Bank predicts that 44 million people will be poor in the medium and low income countries,” warned Leong. Leong said a key factor of the financial pressure was stagnation of salariesin the past decade, citing a World Bank report that on average, a Malaysian's salary had only increased by a mere 2.6 percent between 2000 and 2010. 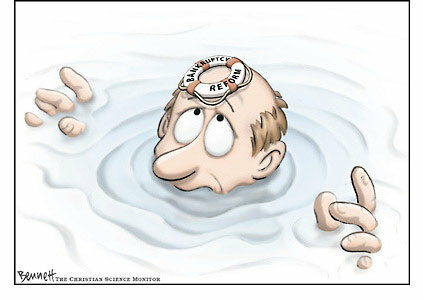 “When this is compared with the inflation rate of 3.2, the buying power of consumers has plunged. Although economists claim that all assets and price inflation in Malaysia is under control, a layman will tell you that he has been burdened by the price hikes in goods and services since last year,” he added. SHAH ALAM: The Sultan of Selangor has suspended the datukship of former transport minister Tan Sri Chan Kong Choy and revoked the title awarded to Ekran Bhd’s former executive chairman Tan Sri Ting Pek Khiing. Sultan Sharafuddin Idris Shah stripped Chan’s title pending the outcome of his cheating trial while Ting’s was revoked as he was a bankrupt. State secretary Datuk Khusrin Munawi said the charges against Chan were serious as it in- volved the country and public interest. “The title will be returned if he (Chan) is proven innocent,” he said in a statement yesterday. Chan received the title in 2003. In Feb 28, Chan claimed trial to three counts of cheating over the Port Klang Free Zone scandal. On Ting’s datukship, Khusrin said the Sultan made the decision as it was not suitable for a bankrupt to carry the title. Ting, who was declared bankrupt by the Insolvency Department in Oct 29 last year, was conferred the datukship by the Selangor Palace in 1996. The title was revoked effective March 24. Businessman Tan Sri Dr Ting Pek Khiing is a bankrupt and all his personal assets will now be vested with the director-general of insolvency. This follows his decision last Friday to withdraw his application of not enforcing the bankruptcy order against him. Ting, the former developer of the Bakun project via Ekran Bhd, was declared a bankrupt on October 28 2010 by the Kuala Lumpur High Court. But he appealed against the bankruptcy notice on October 29 2010 and asked for a stay so that it will not be enforced. "On Friday (November 12 2010), Ting withdrew his application for a stay of the adjudicating & receiving orders entered against him. A hearing date has yet to be fixed for his appeal against the adjudicating and receiving orders," said Southeast Asia Special Asset Management Bhd (Seasam) counsel Alan Gomez of Messrs Tommy Thomas. When asked what was the bank's response to the stay of application and why it was withdrawn, Gomez merely said: "the affidavit had set out the several opportunities and extensions of time afforded to Ting to settle his debt, but despite that Ting had failed to do so". What usually happens following such bankruptcy order is that the Insolvency Department has the responsibility to manage all the assets. The Insolvency Department will then call for a meeting of his creditors who will be required to file their respective proof of debts. The department will call for the first creditors' meeting where the person declared bankrupt would have to appear and provide a list of all his personal assets. Ting's bankruptcy declaration follows a legal suit initiated in 2004 after he defaulted on a loan by Bank of Commerce Bhd. That loan was to part-finance his subscription of shares under Ekran's rights issue in 1997. As at July 2005, Ting owed some RM60.79 million to the bank. Last Monday, Business Times reported that Ting believed that he will be able to settle the debt given the time as monies were owed to him. Ting had then said that should a stay not be granted, both his position and his ability to negotiate the amount due will be affected. KUALA LUMPUR: Those conferred awards which carry honorifics like Datuk, Datuk Seri and Tan Sri can use their titles even after they are declared bankrupt - unless the titles are revoked by the powers bestowing them. Deputy Minister in the Prime Minister's Department Datuk Liew Vui Keong told the Dewan Negara here Tuesday that the Insolvency Department did not have the powers to revoke these titles as they are bestowed by the Yang di-Pertuan Agong, Sultan or Governor. "The power to revoke the titles is at the discretion of the Yang di-Pertuan Agong, Governor or Sultan who conferred the award," he said in reply to a question from Senator Datuk Paul Kong Sing Chu during question time. As of Dec 31 last year, he said that there were 224,943 bankrupt cases handled by the department. However, he said, there is no detailed record to show if those with titles were included. He refuted claims by Senator Zamri Yusof that there have been cases where those declared bankrupt were able to discharge themselves immediately after the order was made against them. He said the speed at which a person was discharged as a bankrupt depended on the effort of the lawyer engaged to handle the legal process in court. KUALA LUMPUR - Deputy Minister in the Prime Minister's Department Datuk Liew Vui Keong has denied claims that titled individuals could easily and quickly discharge themselves from bankruptcy. He said the process of discharging oneself from bankruptcy took time for the individuals involved must apply to the court before the Insolvency Department support or reject the application. "If there were cases where individuals with the titles of Datuk, Datuk Seri or Tan Sri being discharged from bankruptcy quickly, I think this was due to the craftiness of their lawyers, who worked hard to get the cases heard (in court) early," he said when responding to a question from Senator Zamri Yusuf at the Dewan Negara here today. To a question from Senator Datuk Paul Kong Sing Chu, Liew said a total of 224,943 people were declared bankrupt until Dec 31 last year. "The Insolvency Department has no detailed records on bankrupt individuals with the titles of Datuk, Datuk Seri or Tan Sri for only full names and identity card numbers of individuals are stated in bankruptcy petitions," he added.